This story was updated to correct some factual errors such as dates, numbers and names. Steve Smith has a special place in his heart for the art of vacuuming. When he was cutting his teeth in the grocery store business in Virginia and Kentucky, Smith took solace in the fact that "going to the grocery store" was the only family task that ranked above vacuuming. "I was glad we beat someone," said Smith, "and I knew we could do better. People just don't get up in the morning excited because they are going to the grocery store." Nearly four decades later, the president and chief executive officer of Food City looks over the completely rebuilt, 38,000-square-foot Mission Ridge store in Rossville. What he sees is convenience, a store built around customer offerings that are a far cry from the Piggly Wiggly where he learned to run a cash register. The company Smith, his family and his employees own — K-VA-T Food Stores, Inc. — was founded in 1955 in Grundy, Virginia as a Piggly Wiggly franchise. In 1984, Smith saw an opportunity to transform the company from a small, local operator into a regional player with the acquisition of Quality Food Stores, which operated as Food City since its start in 1918. That purchase, the first of several such acquisitions over the next two decades, more than doubled company's revenues, extended operations into East Tennessee and gave the nameplate of Food City for all of the stores going forward. 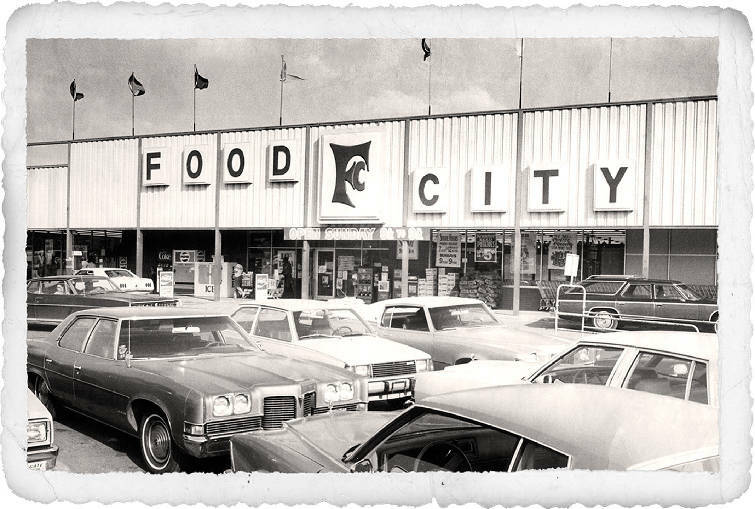 In keeping with that history, Food City is celebrating its 100th anniversary this year. "I can do this a little bit better"
The Food City story begins with Smith's father, Jack Curtis Smith. A Naval Academy graduate, the elder Smith spent several years in California and saw what his son described as "the modern grocery store" of the time. Upon leaving the military, Smith returned to Grundy, Virginia in 1954, where he had a wife and two children. When an expected job fell through, the family business was born in 1955. "His grandmother sent him to the store to buy groceries," Smith recalled, "and he had to stand in line for 30 minutes at the cash register. He thought to himself, 'I can do this a little bit better than they are doing this" and a year later he opened a Piggly Wiggly with 8,800 square feet just in time for Thanksgiving and Christmas. He didn't know anything about running a grocery store, but he was an entrepreneur." With the financial backing of his father, uncle and cousin, Jack Smith expanded into South Williamson, Kentucky in the early 1960s and later into the Kentucky towns of Pikeville and Prestonburg. In the 1970s, Smith acquired two Piggly Wiggly groups in Southwest Virginia, bringing the total store count to 11 when Steve Smith joined the company after graduating from James Madison University with a business degree. The younger Smith, who has been Food City's chief executive since 2001, started going to the grocery store with his father on Sundays when he was only 8 years old. While his father did the family shopping, Smith would stand on a milk crate and run the cash register. "I fell in love with it," Smith recalled about his start in the grocery business after graduating college. "I didn't work for my father but worked with a man who got me intoxicated with the art of motivating people and getting them to do what he wanted them to." Within 10 years of Smith joining the company, the number of grocery stores had grown six-fold after that the family-owned business bought 37 White Stores in Knoxville in 1989 and converted them the next year to the Food City banner. Smith said the the next decade included both good and bad years. "I got to see what it took to merge companies together," Smith recalled. "We went through years of no profit, return to profitability and then no profit again.I saw the raw side of business and was pretty scared. But then I saw that if you worked hard and put people in the right places, you could turn a business around. I saw the opportunity I had been given as a young person, and I believe I owe that same opportunity to people today." Future acquisitions included 11 Piggly Wiggly stores in Southwest Virginia in 1998 and seven Winn Dixie locations in and around Knoxville in 1999 when Winn Dixie pulled out of Knoxville. In February 2006, Food City announced the purchase of eight Bi-Lo locations in Knoxville, Maryville and Oak Ridge. Following the death of Jack Smith at age 81 more than a decade ago, Steve Smith continued the company growth strategy pioneered by his father by entering the Chattanooga market in 2015 with the purchase of 29 Bi-Lo stores in Chattanooga and North Georgia. 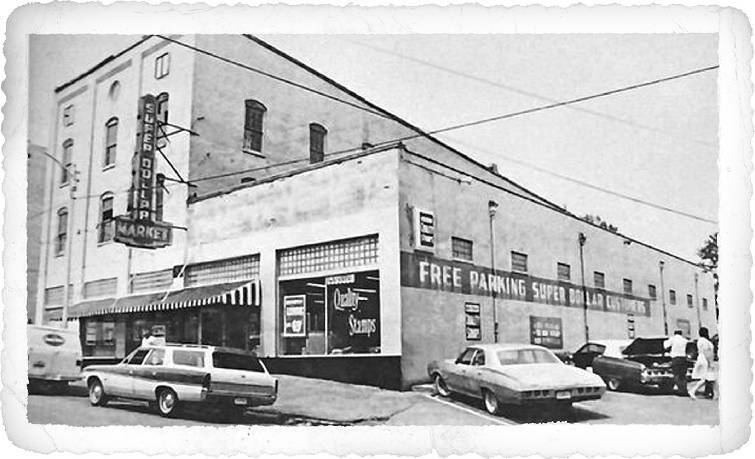 That same year, Food City opened the largest store it has ever constructed, a 62,000-square-foot store in Johnson City. Parent company: K-VA-T Food Stores, Inc.
Leslie G. Sarasin, president and CEO of the Food Marketing Institute, an industry trade group, said Food City has grown as "a vibrant independent operator" that has expanded both organically and through market expansions. "In an age of dramatic change, Food City is a leader in knowing what traditional elements to retain and sharpen while exploring the necessary innovations it needs to make to be relevant," Sarasin said. Smith points to a decision his father made in the early 1980s to move away from a traditional pension with a defined benefit plan for employees and create an employee stock ownership plan (ESOP) as an example of the kind of strategic decision that helped Food City survive and thrive in the competitive grocery store industry. Since its creation, Food City employees have owned as much as 17 percent of the company. Currently, employees own 13 percent of the business. "That decision was ahead of its time," Smith said of his father's move to distribute some of the company's ownership to its employees. "We recognized early the long-term financial liabilities of a defined benefit plan and believed that giving our associates a chance to own part of the company just fit with our philosophy. My father knew that if the associates own a piece of the company they work for, what a difference that can make in how they treat the customers." Smith said creating the ESOP for Food City "was a game-changer" and helped reward the employees who he credits for helping build the business. Under ESOP, workers are given shares in the ESOP according to their compensation. The company also has a 401(k) retirement savings program for its workers. "He knew the associates were what made our company successful," Smith said about his father. "He wanted to engage them and keep them. He also knew that if he decided to get out of the business and didn't have a son or daughter who wanted to run the business, he had a mechanism to sell it to the employees and not someone else." The National for Employee Ownership estimates that there are 6,500 ESOP plans covering 14 million people in the United States in 2018. According to the Pension Rights Center, the first ESOP was created in 1957, but the idea did not attract much attention until 1974 when plan details were laid out in the Employee Retirement Income Security Act. "We are now a mature ESOP because a lot of people who were around in 1984 have seen the stock rise from $2.50 to $150 a share over 30 years," said Smith, whose father died in 2007. "A lot of people are very happy. He saw us get to almost 100 stores and get to a billion in sales. When he left the earth, I am sure he felt the company was in a very good place." Smith said Food City's early commitment to its workforce keeps the company's turnover rate lower than larger, corporate grocery store chains. He said it is normal to award 200, 20-year employee pins each year. "My goal is to grow the company in a prudent, fiscally responsible way that allows people a chance to grown professionally," said Smith. "It's not about making more money. It's literally about giving the chance to someone bitten by the grocery bug to have a career, and opportunity to grow with the company. If you do, people will hang around." Smith said he recognizes that 16,000 employees at Food City "depend on me and my company for a job, and I take that very seriously. "Each time you make a decision, you can impact them positively or negatively," he said. 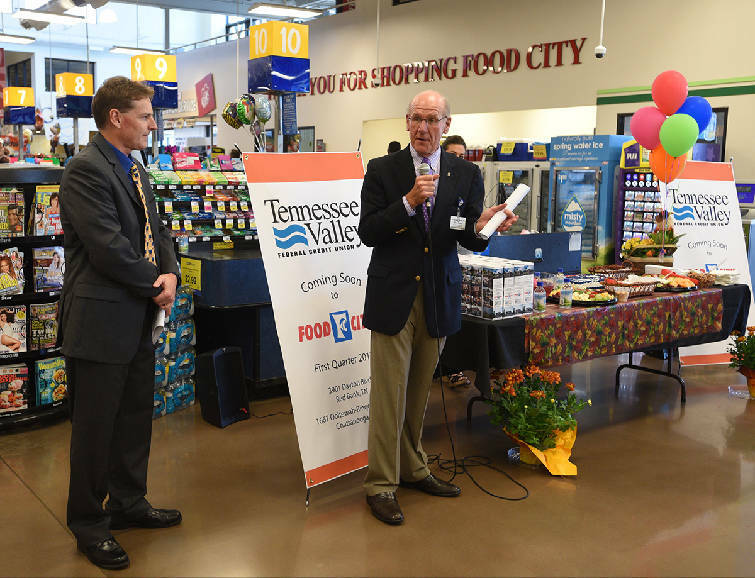 Steve Smith, Food City president and CEO, right, and Todd Fortner, TVFCU president and CEO, talk Friday, Sept. 23, 2016, at Food City in Red Bank about two new branches of TVFCU that will be opened in the Red Bank and East Hamilton Food City locations. Smith also strives to give back to the communities where Food City operates. "My dad had a philosophy that he loved the business, loved people and loved communities in which he did business," said Smith, who spends more than 100 days each year visiting Food City locations. "Each store manager has a bucket of money that he or she gives to community. We look at it as investing in a community and building relationships with organizations that make the community a better place to live." Smith, who has served as chairman of both the Food Marketing Institute and the National Grocers Association, said it was painful to watch families with long histories in the grocery business diminish with the growth of large, corporate chains over the past three decades, particularly after the entrance of Walmart into the national market two decades ago. Walmart began selling groceries in its super centers in 1988 and expanded rapidly in the early 1990s. The retail giant introduced its Walmart Neighborhood Markets concept in 2002. Walmart told investors that it did $200 billion in grocery revenue in 2017, including an estimated $17 billion from its Neighborhood Markets. That far exceeds the No. 1 grocery-only retailer, Kroger, which Statica said had $105 billion in revenue. Publix is fourth at $34.6 billion. Tenth is Southeastern Grocers, which owns Bi-Lo and Winn Dixie, at $10.6 billion. Retail grocery sales in 2017 were $5.3 trillion, according to Statista. With 130 stores, Food City sells about $2.5 billion of grocery sales a year, making it one of the nation's biggest independent, regional supermarket chains. Although only a fraction of the size of Walmart, Food City has successfully competed against the world's biggest retailer by adapting and remaining true to its core mission, Smith said. Smith looks back at Walmart's entry in the grocery store industry and calls it the "Walmart onslaught" that "completely changed our business." He said the fallout was toughest on family-owned grocery store companies. "Grocers were fighting for their very survival because Walmart was aggressive," said Smith. "They were good at what they did, had the resources and were passionate about changing the grocery dynamic. A lot of folks went out of business. We had to decide if we were going to be a shaker or a shakee, and we had to up our game. Weak players like independent grocers got shuffled out." Smith said the Walmart competitive challenge "turned out to be a blessing in disguise for us" by expanding its consumer services, options and convenience. Walmart forced Smith to begin considering what he calls the "perimeter" of his stores, looking to meet the customer's growing expectation of convenience. In-house bakeries, high-end seafood, the highest FDA grade meat in its meat department, fuel and pharmacies became the perimeter. Food City was one of the first to introduce a "valucard", which Smith said was consistent with the company's commitment to building customer loyalty. Food City is a family-owned business that has grown from the first Piggly Wiggly to 130 grocery stores with 16,000 employees and annual revenues of $2.5 billion. On any given day, there is $1 million in inventory in each Food City store, which turns over completely every five or six weeks. The more than 1,000 different produce items, including locally grown produce items, turn over every four days. "Stiff competition always is challenging, but it also serves to bring out our best game; pushing us to innovate, collaborate and adapt new strategies," Sarasin said. "By addressing this challenge successfully, Food City was in a better place to navigate the onslaught of market place disruption that we've seen recently." Smith said Food City is rooted in many of the county-seat towns of western Virgnia, East Tennessee, Southwest Kentucky and Georgia. "We thought that if could deliver something that was truly a one-stop shop that it would be appealing in these smaller towns," Smith said. "Our whole goal is to be close enough in price and be better in convenience to the point that the price differential is not worth the hassle of going to Wal-Mart." Smith said the family's company would continue to grow as it has in the past, slowly and deliberately. With a strong presence from the Tri-Cities though East Tennessee to North Georgia, Smith said the company will expand west next year with a new store in Cookeville. The company will open a new store in Fort Oglethorpe next year along with a second store in Dalton, and Smith said he could see expansion into North Carolina or Alabama in the years ahead. "If anyone had told me 10 years ago that we would be in Georgia, I would have said that wasn't going to happen," Smith said. Smith said the company puts about $10 million into a new store, including the property. He said Food City decided to rebuild the Mission Ridge store instead of refurbishing it because "the thing was just about falling down." 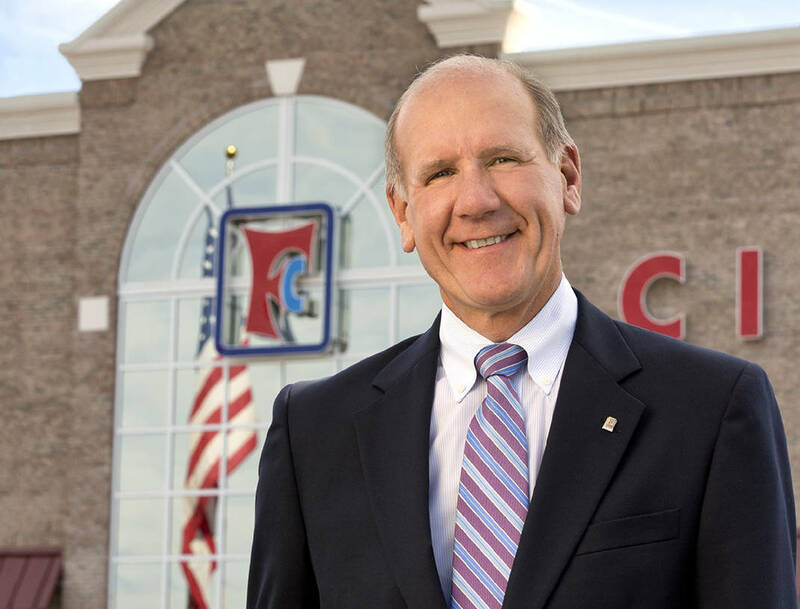 Smith said the excitement over opening a store never gets old, and that it brought back positive memories of the announcement of Food City's entrance in to the Chattanooga market in 2015. The company maintained employment for all the Mission Ridge employees at other stores during the re-construction and points to the additional associates that will be hired as a result. It's a message Smith has told local employees since Food City came to Chattanooga.
" A lot of these folks started with Red Food," said Smith. "Then they were owned by the French, and then the Dutch, and then a private equity firm that took a lot and didn't put much back. I stood up and told them how we were going to rebuild their company. I got just a few head nods." Smith said none of the managers left and that the $40 million investment in local stores since then has convinced them that Food City was not going anywhere. "One of the things that has been the most refreshing coming to Chattanooga are the people we acquired here," said Smith. "It's a great market and a growing market." But truth told, the best thing about Food City coming to Chattanooga in 2015 was that Smith's daughter, Chloe, was a boarding student at Baylor. "I got to see her more than her mother," he quipped. "And that was not always a great thing."